The area postrema is a small protuberance found at the inferoposterior limit of the fourth ventricle. Specialized ependymal cells are found within the area postrema. These specialized ependymal cells differ slightly from the majority of ependymal cells (ependymocytes), forming a unicellular epithelium lining of the ventricles and central canal. The area postrema is separated from the vagal triangle by the funiculus separans, a thin semitransparent ridge. The vagal triangle overlies the dorsal vagal nucleus and is situated on the caudal end of the rhomboid fossa or 'floor' of the fourth ventricle. The area postrema is situated just before the obex, the inferior apex of the caudal ventricular floor. Both the funiculus separans and area postrema have a similar thick ependyma-containing tanycyte covering. Ependyma and tanycytes can participate in transport of neurochemicals into and out of the cerebrospinal fluid from its cells or adjacent neurons, glia or vessels. Ependyma and tanycytes may also participate in chemoreception. The eminence of the area postrema is considered a circumventricular organ because its endothelial cells do not contain tight junctions, which allows for free exchange of molecules between blood and brain tissue. This unique breakdown in the blood–brain barrier is partially compensated for by the presence of a tanycyte barrier. The area postrema connects to the nucleus of the solitary tract and other autonomic control centers in the brainstem. It is excited by visceral afferent impulses (sympathetic and vagal) arising from the gastrointestinal tract and other peripheral trigger areas. The area postrema makes up part of the dorsal vagal complex, which is the critical termination site of vagal afferent nerve fibers, along with the dorsal motor nucleus of the vagus and the nucleus of the solitary tract. Vomiting and nausea are most likely induced by the area postrema through its connection to the nucleus of the solitary tract, which may serve as the beginning of the pathway triggering vomiting in response to various emetic inputs. However, this structure plays no key role for vomiting induced by the activation of vagal nerve fibers or by motion, and its function in radiation-induced vomiting remains unclear. Because the area postrema is located outside of the blood–brain barrier, peptide and other physiological signals in the blood have direct access to neurons of brain areas with vital roles in the autonomic control of the body. As a result, the area postrema is now being considered as the initial site for integration for various physiological signals in the blood as they enter the central nervous system. The area postrema, one of the circumventricular organs, detects toxins in the blood and acts as a vomit-inducing center. The area postrema is a critical homeostatic integration center for humoral and neural signals. Recent studies have implicated its function as a chemoreceptor trigger site for vomiting in response to emetic drugs. It is a densely vascularized structure that lacks tight junctions between endothelial cells, thereby allowing it to detect various toxins in the blood as well as in the cerebrospinal fluid. The area postrema's position outside of the blood–brain barrier makes this particular region of the medulla a key player in the autonomic control of various physiological systems, including the cardiovascular system and the systems controlling feeding and metabolism. A recent study has indicated the existence of prolactin-binding sites specific to the area postrema. The result of the current study has implicated the area postrema as a prolactin target area at which vascular prolactin has the ability to openly associate with neuronal components. Prolactin is a peptide hormone known in lower animals to play a significant role in osmoregulation, originally functioning to influence electrolyte balance, and may now be believed to stimulate reproductive behaviors such as the water-drive before ovoposition in amphibians and lactation in mammals. Another recent study found that the administration of angiotensin II causes a dose-dependent increase in the arterial blood pressure without producing considerable changes in the heart rate. Evidence from this study reveals that the change in the arterial blood pressure depends on the integrity of the area postrema and that this site partially contributes to the action of angiotensin. Damage to the area postrema, caused primarily by lesioning or ablation, prevents the normal functions of the area postrema from taking place. This ablation is usually done surgically and for the purpose of discovering the exact effect of the area postrema on the rest of the body. Since the area postrema acts as an entry point to the brain for information from the sensory neurons of the stomach, intestines, liver, kidneys, heart, and other internal organs, a variety of physiological reflexes rely on the area postrema to transfer information. The area postrema acts to directly monitor the chemical status of the organism. Lesions of the area postrema are sometimes referred to as 'central vagotomy' because they eliminate the brain’s ability to monitor the physiological status of the body through its vagus nerve. These lesions thus serve to prevent the detection of poisons and consequently prevent the body’s natural defenses from kicking in. In one example, experiments done by Bernstein et al. on rats indicated that the area postrema lesions prevented the detection of lithium chloride, which can become toxic at high concentrations. Since the rats could not detect the chemical, they were not able to employ a psychological procedure known as taste aversion conditioning, causing the rat to continuously ingest the lithium-paired saccharin solution. These findings indicate that rats with area postrema lesions do not acquire the normal conditioned taste aversions when lithium chloride is used as the unconditioned stimulus. In addition to simple taste aversions, rats with the area postrema lesions failed to perform other behavioral and physiological responses associated with the introduction of the toxin and present in the control group, such as lying down on their bellies, delayed stomach emptying, and hypothermia. Such experimentation emphasizes the significance of the area postrema not only in the identification of toxic substances in the body but also in the many physical responses to the toxin. The area postrema also has a significant role in the discussion of Parkinson's disease. Drugs that treat Parkinson's disease using dopamine have a strong effect on the area postrema. These drugs stimulate dopamine transmission and attempt to normalize motor functions affected by Parkinson's. This works because nerve cells, in particular, in the basal ganglia, which has a crucial role in the regulation of movement and is the primary site for the pathology of Parkinson's, use dopamine as their neurotransmitter and are activated by medications that increase the concentrations of the dopamine or work to stimulate the dopamine receptors. Dopamine also manages to stimulate the area postrema, since this part of the brain contains a high density of dopamine receptors. The area postrema is very sensitive to changes in blood toxicity and senses the presence of poisonous or dangerous substances in the blood. As a defense mechanism, the area postrema induces vomiting to prevent further intoxication. The high density of dopamine receptors in the area postrema makes it very sensitive to the dopamine-enhancing drugs. Stimulation of the dopamine receptors in the area postrema activates these vomiting centers of the brain; this is why nausea is one of the most common side-effects of antiparkinsonian drugs. A 2002 study in Japan tested a drug that may be of use in curbing the emetic response to drugs that increase dopamine concentrations. The study investigated morphine-induced emesis in ferrets, explaining that morphine exposure triggered dopamine release in the medulla oblongata and in the area postrema by activating opiate receptors, which in turn caused vomiting by the ferrets. Yet a pre-treatment with 6-hydroxydopamine, a dopaminergic neurotoxin, significantly reduced the number of emetic episodes in the ferrets following morphine exposure. This neurotoxin reduced levels of dopamine, noradrenaline, and homovanilic acid, a metabolite of dopamine, and is known to destroy noradrenergic and dopaminergic neurons. Here, 6-hydroxydopamine was injected directly into the medulla oblongata but not in other parts of the brain. This study shows how the dopaminergic pathway in the medulla oblongata may be manipulated in order to reduce the nauseating side-effects associated with so many dopamine-increasing drugs. The area postrema was first named and located in the gross anatomy of the brain by Magnus Gustaf Retzius, a Swedish anatomist, anthropologist and professor of histology at the Karolinska Mediko-Kirurgiska Institutet in Stockholm. In 1896, he published a two-volume monograph on the gross anatomy of the human brain in which the area postrema was mentioned. This work was one of the most important works published in the 19th century on the anatomy of the human brain. In 1937, a publication by King, L.S. claimed that the area postrema was made up solely of glial cells, but this was later disproved by the research of several scientists including Jan Cammermeyer, Kenneth R. Brizzee and Herbert L. Borison, who demonstrated the presence of neurons in the area postrema of several mammal species. Scientists became increasingly interested in the research of vomiting in the 1950s, perhaps in part due to society's heightened awareness of radiation sickness, a condition in which many patients having vomited after radiation exposure died. Intensive studies on vomiting began in the 1950s at the University of Utah College of Medicine, where Borison held a strong presence as both a professor and a researcher. He had received his doctorate in 1948 from Columbia University, establishing himself as an authority on brainstem and neurophysiology. Prior to the research of Borison and his well-known colleague S.C. Wang, a doctor and assistant professor from Columbia University, it was believed that the human body's chemodetection and coordination of vomiting, or emesis, were controlled exclusively by the dorsal vagal nucleus. Yet this idea was "incompatible with the observation that emesis could still be induced by gastrointestinal irritants in dogs with chronic lesions of the dorsal vagal nucleus", and so Borison and Wang dedicated their research to solving this puzzle. Borison eventually explained that their results showed the existence of two areas in the brain related to emesis; one, a chemosensor for vomiting with no coordinating function, located in the fourth ventricle and two, a coordinator of vomiting with no chemosensory function, located in the lateral reticular formation of the medulla oblongata. In 1953, Borison and Wang determined that the chemosensor area acted as a vomiting trigger zone in the brain stem, which they named the chemoreceptor trigger zone (CTZ) for emesis. Using cats and dogs as model organisms, they found that the removal of this trigger zone from the brain allowed for the prevention of emesis in the animals directly following injection of certain chemicals into the blood stream, demonstrating the existence of a relationship between the trigger zone and the act of vomiting. 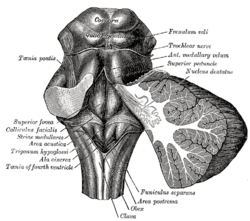 The CTZ was anatomically located in the area postrema of the medulla oblongata. The area postrema had been anatomically identified and named nearly 60 years earlier, but its function had remained unknown until the work of Borison and Wang proposed its role in emesis, which was later confirmed by many laboratories. Research has continued today around the world on the functions of the area postrema. Beyond its role in emesis, as studied intensely by the researchers of the mid-1900s, the activity of the area postrema has been closely linked to other autonomic functions such as regulation of food intake, body fluid homeostasis, and cardiovascular regulation through behavioral studies and electrophysiological studies. In 2007 in Japan, research was performed on the mechanism of excitability of area postrema neurons by extracellular ATP. Voltage clamp whole-cell recording techniques were used on rat brain slices. The results showed that most responses to ATP are excitatory and that they are mediated by particular P2 purinoceptors found in the area postrema. The role of the area postrema in flavor-conditioned aversion and preference was studied in 2001 by researchers at the Brooklyn College at the City University of New York. The experiment tested the effect of area postrema lesions in rats on their ability to learn flavor-conditioned aversion to flavors paired with toxic drug treatments, which indeed showed that lesions of the area postrema leads to impaired flavor aversion learning. A 2009 study followed the development of the area postrema, using a macaque monkey model in an attempt to identify and characterize neurotransmission in this region as well as to resolve outstanding incongruities across research. These scientists found, in culmination, that previous studies suggest noradrenalin and/or dopamine cause CA fluorescence in the area postrema macaque-CA, meaning catecholaminergic or derived from an amine and functioning as a neurotransmitter or hormone or both. The study, however, found evidence of neurotransmitter secretion instead of release in vesicles. Also, their findings concluded GABA is a major neurotransmitter in the area postrema, not glutamate. Ongoing research continues to unravel discrepancies among various rat, cat, and now macaque monkey models of research. ↑ Williams, Chairman of the editorial board, Peter L., ed. (1995). Gray’s anatomy : the anatomical basis of medicine and surgery. (38th ed.). New York: Churchill Livingstone. ISBN 0-443-04560-7. ↑ Miller, A. D.; Leslie, R. A. (1994). "The Area Postrema and Vomiting". Frontiers in Neuroendocrinology. 15 (4): 301–320. doi:10.1006/frne.1994.1012. PMID 7895890. ↑ Price, C. J.; Hoyda, T. D.; Ferguson, A. V. (2007). "The Area Postrema: A Brain Monitor and Integrator of Systemic Autonomic State". The Neuroscientist. 14 (2): 182–194. doi:10.1177/1073858407311100. PMID 18079557. ↑ Ganong, W. F. (2000). "Circumventricular organs: Definition and role in the regulation of endocrine and autonomic function". Clinical and experimental pharmacology & physiology. 27 (5–6): 422–427. doi:10.1046/j.1440-1681.2000.03259.x. PMID 10831247. ↑ Mangurian, L. P.; Jurjus, A. R.; Walsh, R. J. (1999). "Prolactin receptor localization to the area postrema". Brain Research. 836 (1–2): 218–220. doi:10.1016/S0006-8993(99)01655-8. PMID 10415423. ↑ Veljković, S.; Jovanović-Mićić, D.; Japundzić, N.; Samardzić, R.; Beleslin, D. B. (1989). "The area postrema and the hypertensive effect of angiotensin". Metabolic Brain Disease. 4 (1): 61–65. doi:10.1007/BF00999495. PMID 2704347. ↑ Bernstein, I. L.; Chavez, M.; Allen, D.; Taylor, E. M. (1992). "Area postrema mediation of physiological and behavioral effects of lithium chloride in the rat". Brain Research. 575 (1): 132–137. doi:10.1016/0006-8993(92)90432-9. PMID 1324085. ↑ Yoshikawa, T.; Yoshida, N. (2002). "Effect of 6-hydroxydopamine treatment in the area postrema on morphine-induced emesis in ferrets". Japanese journal of pharmacology. 89 (4): 422–425. doi:10.1254/jjp.89.422. PMID 12233822. ↑ Day, C. (2005). "Amylin analogue as an antidiabetic agent". The British Journal of Diabetes & Vascular Disease. 5 (3): 151–154. doi:10.1177/14746514050050030701. ↑ Averill, D. B.; Matsumura, K.; Ganten, D.; Ferrario, C. M. (1996). "Role of area postrema in transgene hypertension". Hypertension. 27 (3 Pt 2): 591–597. doi:10.1161/01.HYP.27.3.591. PMID 8613209. ↑ Bishop, V. S.; Hay, M. (1993). "Involvement of the Area Postrema in the Regulation of Sympathetic Outflow to the Cardiovascular System". Frontiers in Neuroendocrinology. 14 (2): 57–75. doi:10.1006/frne.1993.1003. PMID 8486207. ↑ Klara, P. M.; Brizzee, K. (1975). "The ultrastructural morphology of the squirrel monkey area postrema". Cell and Tissue Research. 160 (3). doi:10.1007/BF00222042. ↑ Bianchi, Armand L. Mechanisms and control of emesis: a satellite symposium of the European Neuroscience Association : proceedings of an international meeting held in Marseille. Vol. 223. John Libbey Eurotext, 1992. Google books. Web. <https://books.google.com/books?id=vb3G_22QLI0C&source=gbs_navlinks_s>. ↑ Miller, Alan D., David J. Stewart, and John Kucharczyk. Nausea and Vomiting: Recent Research and Clinical Advances. Boca Raton: CRC, 1991. Google books. Web. <https://books.google.com/books?id=eVt0fvbJKBEC&dq=herbert+borison&source=gbs_navlinks_s>. ↑ Kodama, N.; Funahashi, M.; Mitoh, Y.; Minagi, S.; Matsuo, R. (2007). "Purinergic modulation of area postrema neuronal excitability in rat brain slices". Brain Research. 1165: 50–59. doi:10.1016/j.brainres.2007.06.003. PMID 17658494. ↑ Touzani, K.; Sclafani, A. (2002). "Area postrema lesions impair flavor-toxin aversion learning but not flavor-nutrient preference learning". Behavioral Neuroscience. 116 (2): 256–266. doi:10.1037/0735-7044.116.2.256. PMID 11996311. ↑ Pangestiningsih, T. W.; Hendrickson, A.; Sigit, K.; Sajuthi, D.; Nurhidayat; Bowden, D. M. (2009). "Development of the area postrema: An immunohistochemical study in the macaque". Brain Research. 1280: 23–32. doi:10.1016/j.brainres.2009.05.028. PMID 19460361.